And no need to have a large balcony to be comfortable, you'll see! There is nothing better than taking a drink on the balcony after work. A moment of relaxation so satisfying. But this moment of relaxation is even more enjoyable when we like our balcony, we find it beautiful and that we feel comfortable and good! Would you like to decorate your balcony so that it is as comfortable as possible? A relaxation area where you can enjoy sunny days and summer evenings and also grow all your favorite plants! Choose nice lights and comfortable chairs. It's not because we don't have a garden that we cannot have a vegetable garden. 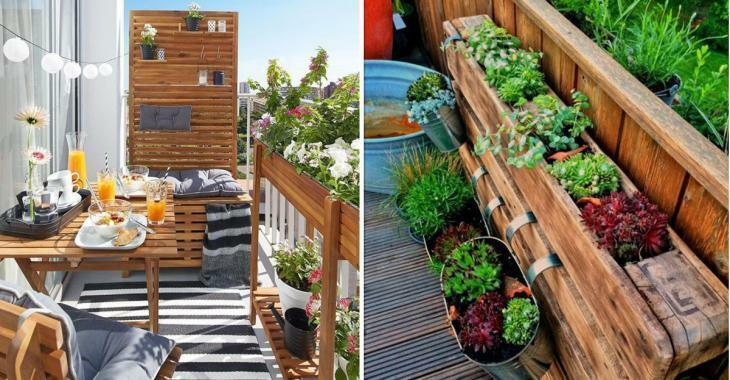 A wooden pallet and landscape fabric can help you build a vertical garden! Furniture can be used to eat, relax and there will even be space to grow your most beautiful flowers and plants! For a maximum of seats, an L-shaped bench is a very good choice. A loveseat will be much more comfortable than a wooden bench, and a coffee table is very original, very useful and decorates the balcony. Notice the floor covered with ceramic tiles. Folding tables are also a great idea to save space! A very small table and 2 chairs, just a small place to have breakfast with your partner. There are several models of folding tables and they are very solid. We can even fix them on the railing! A small bench, cushions and a blanket that you can easily get in and out of the house so they are not wet with rain. Invisible shelves will be perfect for this kind of decoration. Shelves, folding table and an ottoman that we can easily move! Create a small shelf and attach hooks to fix small pots of herbs. This balcony is beautiful ! And finally ... Choose small furniture and add a lot of plants for an inviting and warm space! Do you like all these ideas? Share them!